Do you know centralized cryptocurrency exchanges are not really THAT safe for your cryptos? If you know that, then that’s good. But if you don’t know that, then you should educate yourself more! Using cryptocurrencies means being your own bank and taking care of your own crypto funds. But when we use centralized exchanges like Bittrex or Poloniex, we actually jeopardize that fact. 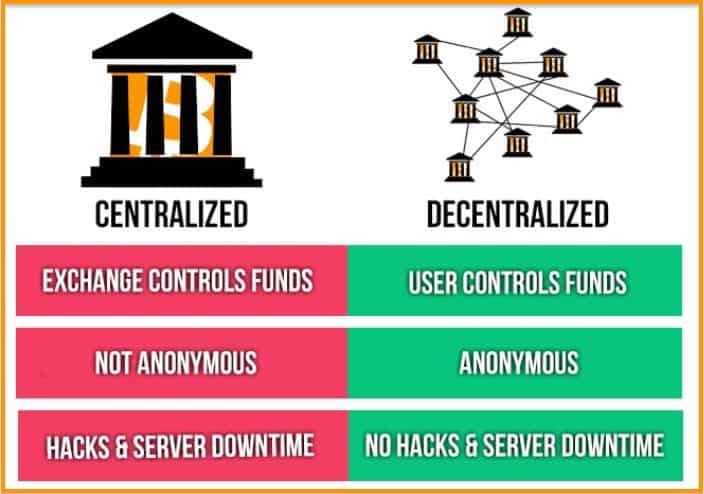 Because from the moment we start using these centralized exchanges, they become the custodians of our funds, and we are no longer in charge. And if this continues, what will be the future of cryptocurrencies? And what’s the solution? The solution is having decentralized exchanges (DEXs). This will, I believe, ultimately decide the future of cryptocurrencies. An exchange that allows its users to control their crypto funds. An exchange that doesn’t have a single point of failure like centralized server hostings or databases that are prone to hacks. An exchange that has no trusted third party setups. An exchange that no government can shut down like the Chinese exchange shutdowns. An exchange that is not controlled by a single or group of companies. An exchange that respects the privacy of its users and doesn’t ask for numerous registrations and KYC verifications. 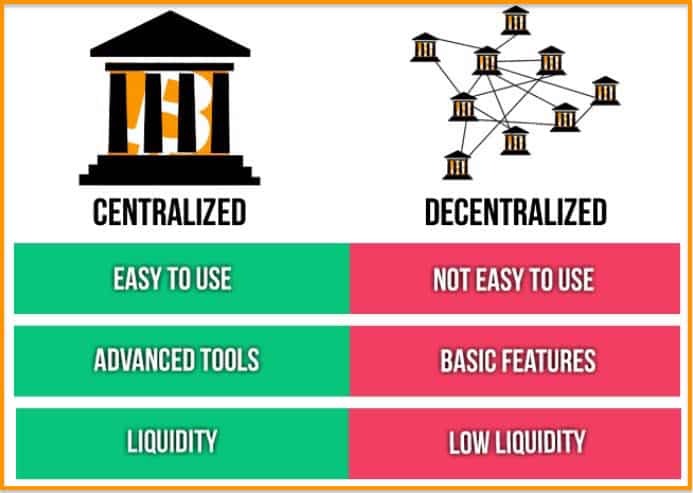 Decentralized exchanges have many benefits. 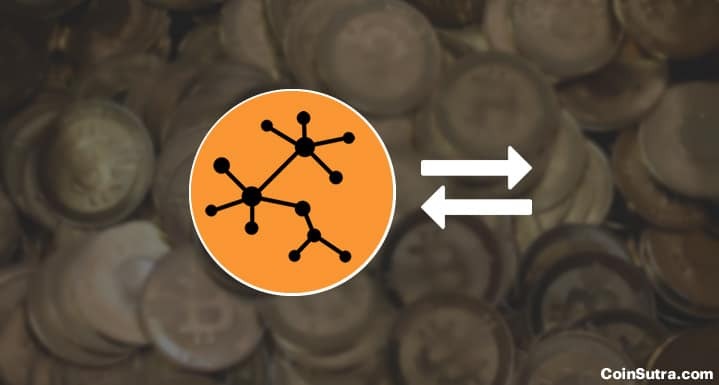 DEXs satisfy the basic tenant of using a decentralized currency/asset because there is no point in using a decentralized currency or asset in a centralized environment which can be taken down anytime. Centralization of exchanges basically contradicts the whole purpose of using cryptocurrencies in the first place. DEXs further catalyze crypto adoption and will allow cryptocurrencies to thrive. DEXs negate the censorship or control of national governments or any group of companies. DEXs make crypto users their own bank. DEXs honor the privacy of their users and bypass the need of doing KYCs, registrations, etc. DEXs do not have downtimes because they will be hosted in a distributed manner. DEXs provide seamless liquidity for many cryptos/tokens that are not able to list themselves after ICOs on centralized exchanges because of several rules/regulations set forth by these exchanges. Users are not habituated using decentralized services. We like centralized services more due to the convenience, and in that process, we give up many things like privacy, freedom, etc. They aren’t so user-friendly (as of now). There are serious liquidity problems due to lack of volume. There is a lack of advanced trading functions such as margin trading, margin lending, stop losses, bot trading, etc. Most DEXs are now are in their beta testing stage, and users stand the risk of losing their funds because of insufficient testing. There is no central authority or support system, so it’s hard to get your problems resolved. After reading the downsides of DEXs, you might say that DEXs will not be successful… but I think they are the only way that cryptocurrencies can survive and thrive. The kind of benefits that DEXs provide will ultimately dwarf the shortcomings. And recent events like the China ban, the Korea ban, and the Russia ban are catalyzing the need of developing DEXs more than ever. And this catalyzation is already witnessing a rapid proliferation of DEX projects in the crypto space. And the surprising thing is that all these projects have entered the crypto-sphere in the last 6-8 months, which in itself speaks a lot about the serious sentiments that this market has toward cryptocurrencies and other decentralized assets. And last but not least, by seeing the proliferation of so many decentralized exchange projects, I am pretty confident that we are going to witness a competitive product in this vertical very soon in the next 6-8 months. Now it’s time to hear from you: What do you think about the future of DEXs? Which DEX project are you following/using? How has your experience been? Did I miss any good DEX projects in this list? Do let me know your thoughts in the comments section below! YoBit Exchange Review: Legit or a Scam? Very interesting post Sudhir. Soon decentralized storage will also be future of cloud storage. Hope you agree on that. @ST Thanks and Yup it will be but it has to become as friendly as centralized services in usage. What are the best alt coins for long term investment (2-3) years? Note: Do Your Own Research also. Hi Sudhir, you should also check out the OpenANX project. It’s a bit of an amalgam between centralized and decentralized, but pretty interesting nonetheless! Sure thanks, I am already looking into it. Will share something soon! What about the long withstanding ones like wavesplatform, openledger, bitshares, bitsquaree, rudex, etc? Is there a company or an existing DEX willing to host a workshop or a introductory training session on setting up a DEX? I’m looking at Draglet out of Germany who really have their professional edge polished, …they’re slick, but they take a big chunk of your start-up cap with no guarantees. I’d rather have my own handle on my own exchange but its tough to get the details from those who know. You can’t have people trust you with their money when you’re lacking the slightest detail in your knowledge base, Anyone out there? Do You know how to bay those or some trust found investing in them? Participating could by profitable. Huge error in piece , district0x is NOT a DEX. You are confusing this with 0x Project (ZRX). Many DEX exchanges are being built on 0x project’s protocol. Thanks for rectification, I meant 0x only but by mistake wrote District0x. What do you think of SDEX? Not quite impressed the way they are doing their ICO. I am keeping an eye on them for now. Thanks for the info there..
Just need to know as to what kind of regulatory hurdles come in the way to launch a DEX.. When most of the countries I believe would not want it to happen..
just that if their tokens don’t have utility then they can be taken down as securities but don’t worry atomic swaps will come to rescue then there is no stopping from any country.